I often have students start at seven or eight years old and then progress to recital level and to school orchestral groups. At this age young people are able to grasp the discipline and understanding necessary to play a challenging instrument. I teach all ages of adult students and have a both a passion and a facility for doing that. I understand so well the frustration of knowing how beautiful the violin can be, while initially being able to produce only a feeble sound. But the learning curve for adults is both shorter and more satisfying as they have a greater appreciation for the music. 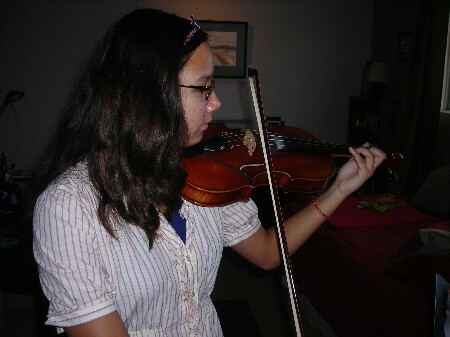 My oldest student was 65; she was playing concertos in two years. Never think it’s too late to start. I reserve a certain amount of my teaching schedule to work with advanced musicians, preparing students for college orchestra and for professional careers. A recent student was welcomed to the MIT orchestra on her initial audition, and another dedicated high school senior earned a full music scholarship to Texas A&M. I also seem to be able to work well with young people who have learning disabilities. I have taught at Quiet Minority – Social Skills for Mentally Challenged Young Adults, as well as Royal Alex Mental Health. One of these students won a full music scholarship to a major university. We have known Ann Dunn for seven years. 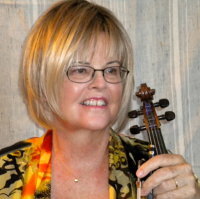 She has taught our son violin. Ann is an extremely gifted teacher. She is patient and waits until he does what he needs to do correctly while remaining firm. My son and Ann get along very nicely, which is another component to being a great teacher. Ann is quite creative and finds a special way to communicate with my son. Her ability to bring out the best in a child is an innate skill that no other teacher could provide for him. Also noteworthy is how she has fostered and inspired the love of music and all of its nuances in our son. We feel extremely fortunate to have her as a teacher and expose my son to the wonderful world of music through the eyes of a violin.